Looking for a good local veterinarian? Being in this business, we have the opportunity to meet many of the local veterinarians. Though Athens has many wonderful vet offices, it takes alot to get a recommendation from Pawtropolis owner Amanda. Mars Hill Animal Hospital is located conveniently just off Highway 78. Dr. Gross, Dr. Leavell and all of the staff take the best care of your pet. They not only offer the best health care for your pet, but also dispense plenty of TLC. This vet office also extends their generosity and care to the animals of Helping Paws Rescue. This is the vet that Pawtropolis owner takes her own pets. 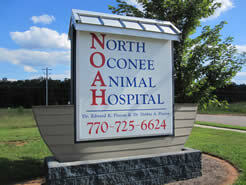 North Oconee Animal Hospital (commonly referred to as "Noah") opened in February '08. Dr. Pinson and his wife have been practicing over 15 years and decided to move and open their own office near Athens. Before even openi ng the doors to the office Dr. Pinson began helping us with the medical needs of our fosters. Noah can help with all of your small animal needs. Their office is beautiful and stocked with all of the most current medical equipment including a digital radiography machine. We first met Dr. Bates when he worked at Firehall 4 Animal Hospital. We were so excited for him when we found out he was opening his own practice in Watkinsville. Dr. Bates is awesome! He always takes a vested interest in all th e dogs we bring in, making no difference because they are "rescue" dogs. It is obvious by his personalized care that he has a big heart and is definitely in the right profession. Congratulations on your new practice!! Located in a remodeled fire station, Firehall4 is conveniently located on the corner of Hawthorne and Oglethorpe in Athens. Not only do many of our clients and staff use the veterinarians at Firehall but they also give us large discounts for our foster dogs. Firehall 4 has really become a partner with us in caring for pets in the Athens Community. We would highly recommend them. Winterville Animal Clinic is a vet that so many of our eastside clients rave about. They are known for not only loving care but for also being very reasonably priced. Several of our staff use them as their pets' veterinarian. Shoal Creek Animal Hospital is located on Barnett Shoals Road on the Eastside of Athens. (In the small shopping center located in front of Kroger.) The staff is always happy to see you. The doctors are great, spending ample time with each patient. South Athens Animal Hospital is conveniently located right off of loop 10 and Milledge Avenue. 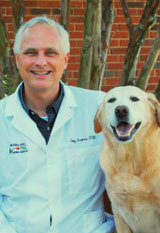 Here you can expect Dr. Mark Mosher, Dr. Thomas Nemetz and their staff to take excellent care of your dog and cat. Located right off of Atlanta Highway near Publix, Hope Animal Medical Center is the vet of choice for many Pawtropolis clients! Never heard of Doggie Daycare? The benefits of allowing your dog to attend doggie daycare are astounding. For young dogs it teaches them invaluable social skills that will help them learn how to properly meet and interact with a variety of other dogs. It also helps young puppies with their potty training because we keep them on a very routine potty schedule. 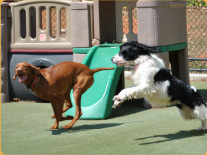 See an extended explanation of dogs in packs and the benefits or doggie daycare.